The Golf Club is all on one level which makes access easy. However, the doors are really heavy and I had to go through backwards so that my support worker could hold the door open and pull my wheelchair though at the same time. There is an accessible path all the way round the Golf course and driving range is fully accessible for wheelchairs. There is a small accessible bathroom which meets the national legislation. The lifts are very narrow so it is really hard to use them if you need someone to help you. A key is needed to use the 'accessible' toilet. The main entrance has steps so can't go in that way. The only way to get in is to go around the side and wait for someone to come and let you in. Not good. The main part of Elbow Rooms where all of the pool tables, screens and place to eat is up lots of flights of stairs. 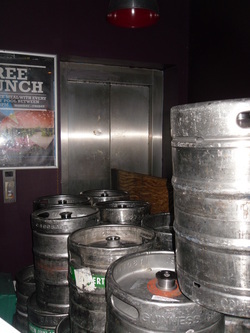 They do have a lift but when I went to look, the lift access was blocked by lots of beer barrels, (see picture) so no way for me to get in. The access to the Playhouse is great. There are automatic doors with big buttons to hit to get in. Once inside, there is a lot of space to move around in and a lift which takes you to the different levels. The lift is a bit small but me and my helper managed to get in ok. The cafe has lots of space and easy to move around in. The Playhouse also has an amazing Changing Places room which it great. There is loads of room along with a H-Frame hoist, changing bed, shower and properly adapted toilet. 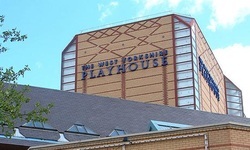 The Playhouse is a brilliant venue for anyone with any kind of disability and it is top of my list of places to go in Leeds. I can't talk about access in the theatre yet, but I am going back soon to watch a show, so I will update then. 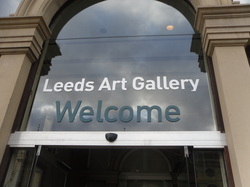 I looked forward to trying a new cinema in Leeds. The Everyman cinema at Trinity sounded very different with style and seating to other cinemas. I booked in advance and found that the only accessible spaces for wheelchairs was on the front row. All other seating had to be accessed by steps. This meant that I had to watch the film from the front row and was very close to the big screen... a position most able-bodied people would avoid if possible. I had no other choice. Half way through the movie, I had to leave. My neck was hurting from having to strain it to view the big screen from so close-up. The staff were very helpful and the manager gave me a full refund for my movie ticket. The manager apologized and said that even though they had only been open a month, they had already received several complaints on accessible seating. They told me they would look into this issue further and that we should visit again in the future to see if improvements have been made. The disabled toilet was adequate and a lift was available to take me between floors. I could not wait to see what the new Leeds Arena was like! I was offered a guided tour, including back-stage areas, shortly after it had been opened. Obviously it is huge and can hold 13,500 people, however I did not expect there to be as many spaces for wheelchairs (and for carers) as there are. I couldn't count them, however there is an entire row of the arena dedicated to these spaces... and that is a lot! The accessible areas offer amazing views and generous comfort with easy access to the disabled toilets. The lifts are a good size but there is one problem... you may have to wait! That is not a bad point though as it just shows how popular this place is with wheelchair users! The arena offers a free ticket for a carer/support worker which is really good! 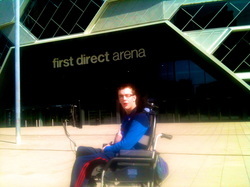 There are plenty of nearby disabled parking spaces to the arena, however these can get taken quickly for a big event. Staff are friendly and well trained to assist people with accessibility needs. 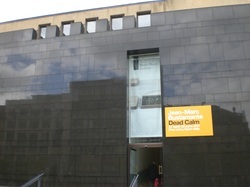 This is my favorite place in Leeds!